ECC's AIS module is an excellent choice for a harbor management base station. ECC's GLOBE-AIS module receives data from your AIS hardware and displays the information on GLOBE's vector charts or on raster charts. The module provides easy access to the data broadcast from AIS equipped vessels. The module also greatly simplifies AIS based messaging. Displays a list of AIS equipped vessels with Name, MMSI, and Call Sign in an easy to read table. Designate targets as active to toggle the display of Name, Call Sign and Speed with the target icon. Deactivate targets to reduce screen clutter. Access all transmitted data by right-clicking on the target or by bringing up the Targets Page. Receive and send messages from the Message Center. The Message Center includes Group Messaging to send a message to a selected group of vessels. Easy data entry forms for entry of static vessel and voyage data. Color code targets by activity. Show underway or stopped vessel targets in different user-defined colors. Active Vessels have predictor lines that show CPA when other AIS equipped vessels are in a defined range. Zoom in to show targets drawn to the scale of the chart view. One AIS receiver serves all GLOBE desktop licenses. Group Vessel Visibility. View only selected vessels as AIS targets. Host Vessel. GLOBE will display all AIS data from the perspective of the host vessel. The Instrument Panel will display host vessel log data such as speed, heading, COG and tide graphs. ECC's Log Browser feature is an effective tool when replaying AIS logs. GLOBE's log is enhanced with an easy to use reporting feature. 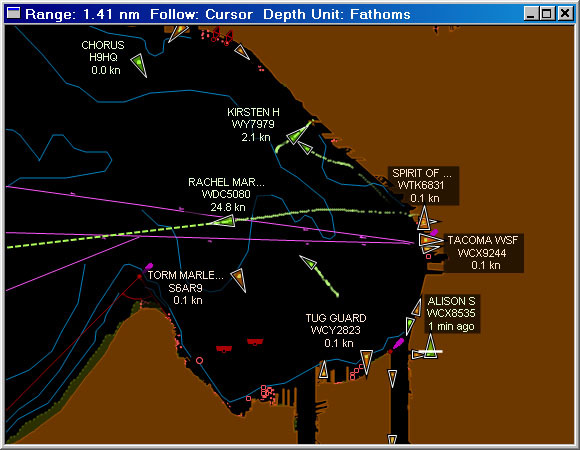 Replay logs or view the activity of individual or multiple vessels in a graphic report. Print reports in graphic, text or both formats. Graphic reports include selectable scales for printing.